Christopher Ricardo Gonzalez, an 18-year-old fugitive wanted out of Dallas, Texas, was arrested in Woodland Hills on Tuesday, Sept. 19, 2017. LOS ANGELES -- A fugitive from a Texas "10 Most Wanted" list was captured in Woodland Hills early Tuesday after an Instagram live video led police right to him. 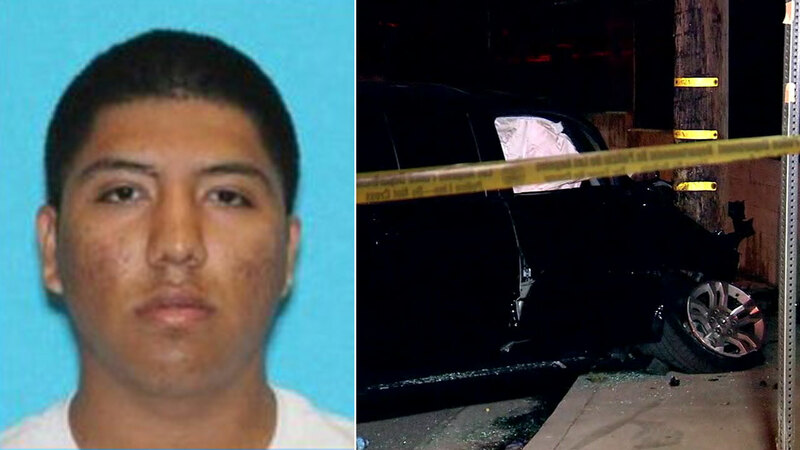 Christopher Ricardo Gonzalez, an 18-year-old murder suspect wanted out of Dallas, was arrested shortly before 2 a.m. near Serrania Avenue, according to Los Angeles police. Dallas police contacted the LAPD after Gonzalez streamed a live video on Instagram, showing a shotgun and other weapons, authorities said. Dallas officials were able to provide GPS coordinates of the video signal, and LAPD undercover officers ultimately located the suspect vehicle, a rented black Chevrolet SUV. The suspect immediately took off in the SUV and a chase ensued. The pursuit ended when the vehicle crashed into a power pole in the 4800 block of Serrania Avenue, where Gonzalez and a second suspect ran out of the SUV and hid in the area. Gonzalez was found and bit by K-9 officers. He was arrested at about 1:50 a.m., and the second suspect was found about an hour later, police said. Woodland Hills homeowner Todd Melnik witnessed the end of the chase and the dramatic arrest play out on his front lawn. "I started hearing the suspect screaming," Melnik recalled. "They called the dog off of him and then they order him to crawl backwards from inside the bushes next to my fence, backwards onto my front lawn." He thinks the officers did a good job showing restraint and only using non-lethal rounds against the armed suspect. "I thought there was going to be a shooting on my front lawn, honest to God. It was a really dramatic moment." Only one weapon from the Instagram video has been found. Gonzalez, known as "Little Chris," is affiliated with a clique of the infamous Bloods gang. Along with murder allegations, he was allegedly involved with a number of aggravated home invasions in Dallas from October 2016 through February 2017. A $5,000 reward had been offered by Dallas police for his capture.